This satisfying skillet recipe is the perfect dish to make when you are short on time. 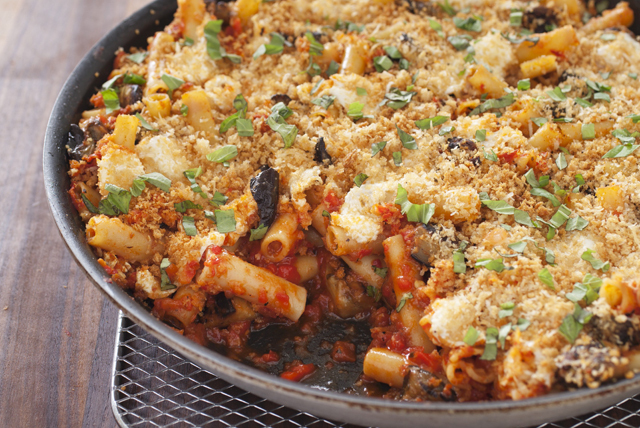 Tender ziti pasta and eggplant are cooked in a savoury sauce, then topped with Parmesan-flavored bread crumbs for a fun twist on a traditional pasta favourite. Heat 3 Tbsp. dressing in large ovenproof skillet on medium-high heat. Add eggplant, onions and garlic; cook 7 min., stirring occasionally. Stir in pasta sauce and water. Add pasta and basil; mix lightly. Bring to boil; simmer on medium-low heat 20 min. or until pasta is tender, stirring occasionally. Stir in 1/3 cup cheese. Heat broiler. Combine bread crumbs, remaining cheese and dressing; sprinkle over pasta mixture. Broil, 6 inches from heat, 2 min. or until golden brown. Serve with a crisp mixed green salad tossed with your favourite Kraft Dressing. Garnish with additional fresh basil just before serving.